Orkin professionals are trained not only to address current infestations but also to prevent future infestations. Scheduling a home inspection may help you get rid of rodents. Problems with DIY – Homeowners may seek homemade solutions to their rodent problems. They may try a variety of repellents such as mothballs or even essential oils. These homemade methods are not capable of addressing full-blown rodent infestations. It is recommended that anyone experiencing a rodent infestation contact a pest control professional to arrange for a consultation. ARE RODENTS CAUSE FOR CONCERN? 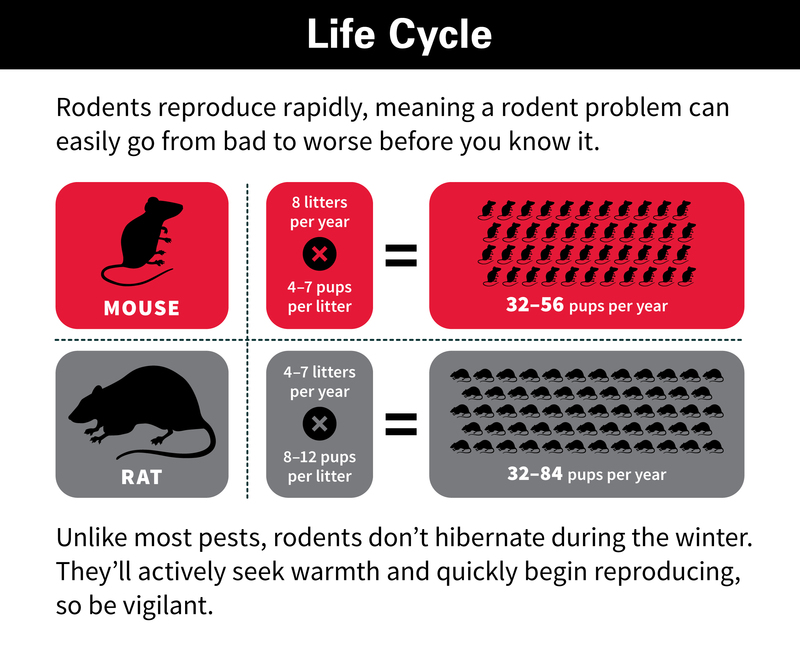 Rodents & Disease – In addition to being tough to control, rodents may carry diseases and taint food with waste, fur, and saliva. In fact, mice can contaminate about 10 times the amount of food they eat. The CDC links some rodents to hantavirus pulmonary syndrome, a disease fatal in about 36 percent of all reported U.S. cases. The pests are also hosts for fleas, which can spread plague and diseases like lymphocytic choriomeningitis virus. This illness mostly affects those with weakened immune systems and may result in headaches, fever, and meningitis. It can also cause complications during pregnancy. Rodents thrive across the world in almost any habitat with access to food and water. Because of their small size, they can be difficult to keep out of a home. Rats can get indoors through holes the size of a quarter, while mice can use gaps the size of a dime to come inside. Read more information about rats. Access: Mice invade your home seeking food, water and warmth. Read more information about mice. Rodents are some of the most adaptable creatures on the planet and can be extremely difficult to exterminate. Infestations can cause considerable damage to infested buildings and local agriculture as well as the proliferation of many diseases hazardous to humans. Unified efforts on the part of neighbors can prove extremely effective in preventing infestations. Within apartment buildings and neighborhoods, coordination of prevention measures may include cleaning efforts and landscape alteration. And on an individual level, homes can be rodent-proofed through identifying and sealing as many possible entry points. In order to protect your home, garden and health from existing rodent infestations however, professional, customized solutions are often necessary. Keep any possible food sources away from rodents. Small crumbs and garbage are popular sources of infestation, as are dry goods such as grains and cereals. These should be kept in sealed metal or glass containers to prevent contamination. Fruits and vegetables should also be stored properly, and resulting waste should never be left in sinks or on counters. Cardboard objects prove attractive to rodents, as they tend to chew them up for use in their nests. Because of the rodents’ body plan, they are capable of squeezing through spaces that appear to be much too small for them. All such holes should be sealed to prevent entry and reentry of rodents. Rodents tend to be rapid breeders. Some species breed year-round, and populations are maintained through constant reproduction. Females produce pheromones that attract the attention of males. After sensing the female’s hormones, the male mouse emits an ultrasonic mating call. A female mouse produces between five and eight offspring after mating. Although females are protective of their young, some also consume their offspring if exposed to high stress such as famine. Mice young are blind, deaf and hairless for the first three days following birth. For mice with dark adult coloration, pigmentation of the skin begins on the third day. Within five to seven days, fur begins to grow and the ears become receptive. Eyes open between days 10 and 14, at which point young mice become mobile and begin to feed on solid foods. In 21 to 28 days, babies wean from their mother’s milk. They reach maturity between days 28 and 35 and are then capable of reproduction. Some specimens are capable of breeding at six weeks. Mice tend to live for approximately one year. Depending on the species, the life expectancy of a rodent is eight days to two months or, in some cases, up to a year. One pair of rodents can produce more than 1 million offspring through their offsprings’ offspring in a matter of weeks. Biting rodents feed on blood, attacking humans and other animals as food sources. Some are capable of transferring disease through these feeding habits. Some of the largest rodents in the world, horse rodents are common throughout North America and produce extremely painful bites. While filth rodents, such as the common house rodent, are attracted only to offal and manure, biting rodents will actively irritate pets. Large populations can seriously impact your pet’s health.